Sales of existing homes in recovered in August, perhaps the result of a post-tax credit normalization. As compared to July, Existing Home Sales rose 8 percent in August, buoyed by falling interest rates and slow-to-rise home prices. There’s lot of “good deals” out there and home buyers are taking advantage. The housing gains are relative, however. August’s total units sold barely crossed 4 million and still trails the average figures of the last few years by close to 1 million units. Sales growth is not limited by geography. All 4 regions — Northeast, Southeast, Midwest, and West — showed improvement last month. Repeat buyers are driving the market, representing 48 percent of sales, up from forty-three percent in July. And, perhaps most important to the housing market market, the number of available home resales dropped by almost one full month last month. 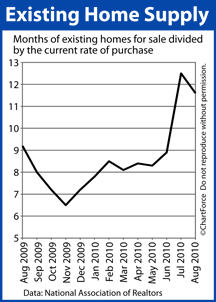 At the current sales pace, the national inventory would be depleted in 11.6 months. For home buyers, the data presents an interesting opportunity. With average mortgage rates rising from their best levels ever and home affordability cresting , this autumn may represent the turn-around point for the housing market nationwide. This may mean that the soft market will start to firm up. But we still have winter ahead, it costs a lot to heat an empty rehabbed house while you wait for a buyer.